This year is an important year for Hanson fans. Hanson is celebrating 25 years as a band, and 20 years since their album debut with Middle of Nowhere. While we are waiting for the Best Of album and a new Christmas album (yay! 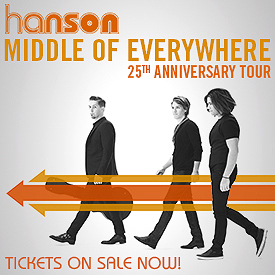 ), they have released the dates for the first leg of their Middle of Everywhere 25th Anniversary World Tour! Pre-sale concert tickets went on sale today for fanclub members, and tickets go on sale for the general public on Friday. Here are some of my videos from the “Shout It Out” show, plus the video of Taylor’s walk speech. This was the day when I felt the most like a crazy fangirl – because of the crazy early arrival to the venue! But it was worth it when it was time for the final The Story and the final concert. That the day also offered an official Walk together with Isaac, Taylor and Zac (in pouring rain, thanks London!) only made the trip even more memorable! Here are some of my videos from the “The Walk” show. “Been There Before”, “Running Man”, “Change In My Life” and more. Here’s my concert report from Hanson’s fourth show during the 5 of 5 London concert series! Here are my videos from the third show, Underneath. “Dancin’ in the Wind”, “Lost Without Each Other”, “Broken Angel”, “Lulla Belle” and more.